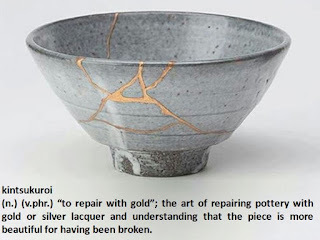 Kintsukuroi, �to repair with gold�; the art or repairing pottery with gold or silver lacquer and understanding that the piece is more beautiful for having been broken." Interesting phrase and theory is it not? Most in our society look at anything broken as throwaway items - but not the Japanese - the consider Kintsukuroi pottery to be more beautiful for having been broken. Kintsukuroi finds and celebrates the beauty in the flaws - And I�m totally down with that. There were times when I considered myself broken because of certain aspects of my life. Broken because of the people I loved and who are no longer alive and the status of my permanently busted pancreas. Perceiving myself as "being broken" stopped me in my tracks - even though my legs worked perfectly. But I�m not broken because of losing loved ones or my busted pancreas, I am anything but. And I choose to see myself as Kintsukuroi. Those I�ve lost are with me still - and I find comfort in the memories. And while I still shed tears for them - I find myself smiling when I think of them and I gain strength from their memories every day. Diabetes has left marks on my body and my soul. My are fingers scarred and callused from years of checking my glucose. Scar tissue is a theme throughout my body - my abdomen has deadspots from 13 years of insulin pumping, as do my arms and legs from 25 years of multiple daily injections before pump therapy. Thanks to diabetes, my tendons play tricks on me, forcing me to listen to and take notice. Diabetes has perpetually caused me to say I�m sorry, even when I�m not. Diabetes has made me lean on others - and has allowed others to lean on me. Diabetes makes me listen to my body, even when I don�t want to. Diabetes has helped me to develop a twisted and wonderful sense of humor. Diabetes has forced me to be tenacious and get back up again. And as previously stated, diabetes has caused me to feel broken. But now I see that there�s beauty in the flaws - there are works of art in the gold and silver flecks of strength and resilience that make me who I am. Kelly as Kintsukuroi - more beautiful, strong, and resilient for having been broken. The DOC (Diabetes Online Community,) as Kintsukuroi -more beautiful, strong, and resilient for having been broken.